The Sessions window has 5 sections: session, performances, performers, solos and notes. The session section, in the upper part of the window, contains data fields relating to the overall session date. The Performance tab, contains the fields to add performances and data associated with each performance to the session. The Performers tab, contains fields used to add performers to each performance. The Solos tab contains information about solos played in the performances. The Notes tab, contains source, citation and work notes fields. While in read mode, only the session filter and session list fields of the session record section can accept data. To select a session to view or edit, use the session list at the right of the window. This list displays all sessions in the database using the specific date or the text date, if entered. The session filter field above the session list is used to narrow the selection of sessions based on artist, leader, or label. Enter a personnel or label name in the filter (which is a lookup field) to select a person or label. If the Performer radio button is selected, the list will be filtered to include any session containing that person as a performer. If the Leader radio button is selected, the list will be filtered to include any session where the person is the leader of the session. If the Label button is selected, the list will be filtered to include any session for that label. Figure 1 - Sessions window with performances on display. Date The date the session took place. ca. Clicking this checkbox will indicate that the date entered for the session in approximate. This checkbox will be used to add a "ca." to the date on reports if a Text Date is not entered. Using the Text Date is recommended over using the Circa checkbox. Text Date This date field will only show up on generated reports. It is used when a session date needs to be identified by a non-standard date such as "late summer" or "first week of March" or "Dec. 5-7, 1947". This field is optional, but if used the Date field must also be filled in for sorting purposes. This is a handy feature if you have several sessions where you don't know the exact date but do know the sequential order. Use the Date field to enter exact dates to create the order and then use the text date field to enter something like "late February". Only the text "late February" will appear on any session reports but the individual sessions will be ordered according to the Date field. Title Some discographers like to create a title for the session. Often times the title of the album created during the session is used for the session title. Venue The location where the session took place. City The city where the venue is located. Label The original label for which the session was contracted. Label is a lookup field. When in edit mode the Sessions window will only accept a label name that has been previously entered using the Labels window. The use of the label here has nothing to do with the use of the label applied to issues. A session may have been recorded for one label, but the resulting issues and reissues could be released by any number of different labels. Type The type of session. This popup can be modified by using the Preferences window. When the window is in read mode, the popup is not operable. Session reports can be filtered by the session type. Last Update This is a read-only field that displays the date/time stamp of the last update to the session record. In addition to updates made via the Session window, this includes any updates made via the Session Sidemen and Add Performances windows. No Exceptions If this box is checked, a session report will not include personnel exceptions for this session. Some sessions have exceptions that do not report well using the standard exception layout used by the session report layout. In this case, it is better to format the exceptions manually in the Session Notes field. Flagged Turning on this checkbox will mark the session as flagged. What it can be flagged for is up to the discographer. It will provide a useful tool to keep track of sessions for a variety of reasons. Most likely, the flag status can be a way for discographers to mark sessions that need more work. Use the Lists->Sessions->Flagged Sessions menu to see a list of all the flagged sessions. No Reports If this box is checked, the session will not appear on any of the generated reports. This is useful for preventing unfinished entries from appearing on a report. New Session Use this button to put the window into a mode that will allow adding a new session. When this button is pressed, all fields will be blanked, and the Edit Session and Delete Session buttons will be changed to Save Session and Cancel New/Edit respectively. Once the fields are entered, pressing the Save Session button will commit the new session to the database. Pressing Cancel New/Edit will revert the window back to the state it had before New was pressed. No changes will be saved. Edit Session Use this button to put the window into a mode that will allow modifying a session. When this button is pressed the Edit Session and Delete Session buttons will be changed to Save Session and Cancel New/Edit respectively. Once the fields are modified, pressing the Save Session button will commit the changes to the database. Pressing Cancel New/Edit will revert the window back to the state it had before Edit Session was pressed. No changes will be saved. Delete Session Pressing this button will remove the session from the database. This action is unrecoverable. Below is a graphic of the Sessions window as it appears when the Edit Session button is pressed. The window will look the same when the New button is pressed except that all fields will be blank. Figure 2 - Session window when Edit Session button is pressed. Save Session The Edit Session button is converted to the Save Session button when the window is in edit mode. Once the fields are modified, pressing the Save Session button will commit the changes to the database. Cancel New/Cancel Edit The Delete Session button is converted to the Cancel button when the window is in edit mode. The label will be Cancel New if the New Session button was pressed or Cancel Edit if the Edit Session button was pressed. Pressing Cancel will revert the window back to the state it had before the New Session or Edit Session button was pressed. No changes will be saved. Left arrow near Labels field The Labels field becomes a lookup field when the window is in edit mode. Use this button to navigate to the previous (in alphabetical order) label record. Right arrow near Labels field The Labels field becomes a lookup field when the window is in edit mode. Use this button to navigate to the next (in alphabetical order) label record. 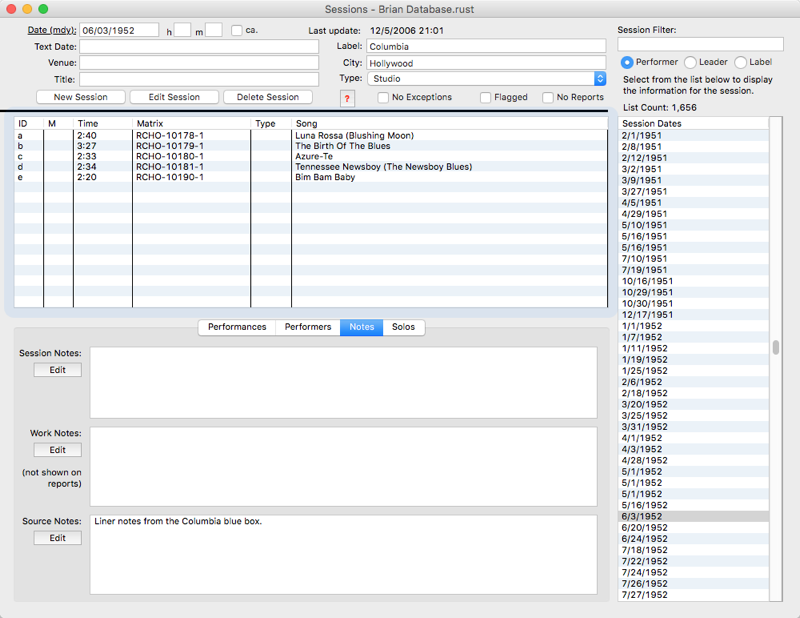 Use the Performances section of the Sessions window to add or edit performances. The Session Performances section of the window uses the 2 step edit mode. Performance Title Performance Title is a lookup field. Only songs previously entered in the Songs window can be used in this field. Type the leading significant characters of the title and watch as the select list below the Performance Title field will display the entries that match. Select one of these. As each song title is displayed in the field, the composers of the song are also displayed in the Composers listbox to the right below the Performance Title field. Timing Enter the hours/minutes/seconds timing for the track. These are optional and default to 00 if not entered. On tabbing out of the Song field, the cursor will jump to the minutes portion of the timing field. This is because the hours portion is so infrequently used. Use the mouse to click on that field if needed. Matrix The matrix number is a number that is sometimes assigned to a take during a session. Here it is an optional field. Take This popup field is used to select the type of take for the performance. This popup can be modified in the BRIAN Preferences window. Buttons become active depending on the state of the window. The Add Performance button is active when a valid song is displayed in the Performance Title field. The Remove Performance or Update Performance buttons are only active when a performance is selected in the performances listbox. Add Performance Pressing this button will add a performance to the session. Fill in the fields with information on the performance and then click on the ADD button. The song will then be added to the session and appear in the list box. Remove Performance Pressing this button will remove the performance selected in the performances listbox from the session. A prompt will appear to verify that the remove is correct. Press REMOVE to confirm or CANCEL to cancel the remove. If the performance is linked to any issue, a subsequent warning message will appear with the option to cancel or confirm the remove request. Alternatively, the delete key on the keyboard can be used in place of pressing the Remove Performance button. Update Performance This button will change data for a performance. To change data for a performance, first select it from the list. This will automatically fill the text fields with information stored for the performance. Change whichever data needs changing - the song title, timing, take type - and then press the change button to apply the changes. 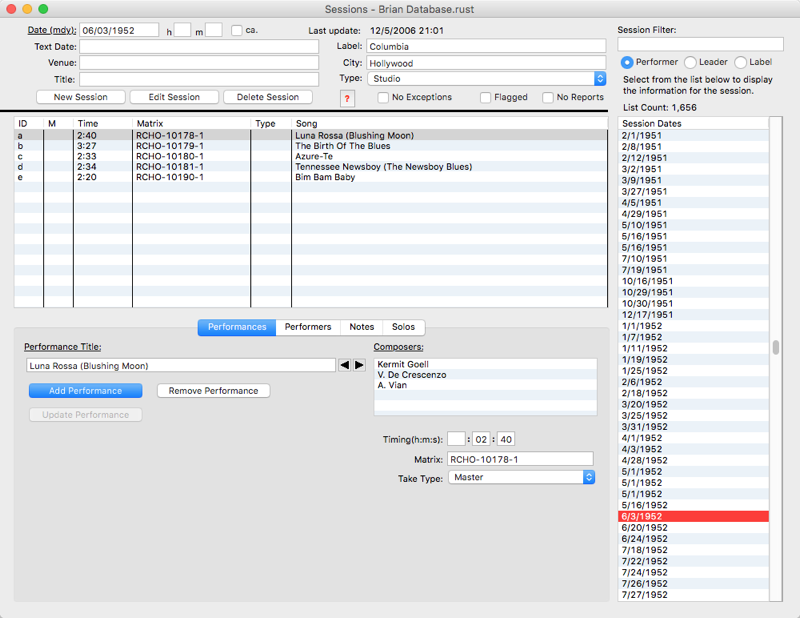 To move a performance from one session to another, you must first generate a list of performances from the Lists menu. To generate the list, you must have a person selected in the Personnel tab of the Songs/Personnel/Labels window. Of course, you would select a person that is performing in performance you want to move. Once the person is selected, use the Lists->Personnel->All Performances of Person menu item to generate the list. Next, display the receiving session for the performance in the Sessions window. Select the performance you want to move from the generated performance list and drag it to the performance list displayed in the Sessions window. A dialog prompt will appear to confirm the move. Press the MOVE button to confirm the move or the CANCEL button to cancel the move. Pressing the Move button will cause the performance to be moved to the session where the performance was dropped. Along with the performance, all the sidemen associated with the performance will be added to the target session. If the performance was used in an issue, that relation remains. Performances are listed in the order they are entered. To change the order, click on a performance entry in the listbox and drag it to elsewhere in the list. BRIAN will automatically update the sequence of the alphabetic id of the performances to reflect the new order. To designate two of more performances as sections of a medley, first select the performances. Do this by holding down the Command (apple) key (Ctrl key on Windows) and clicking on each performance that is part of the medley. When two or more performances are selected, the Medley button will become visible in the window. Click on the button and all selected performances will be marked with an identical medley indicator. Clicking on any performance that is designated as part of a medley will cause the Medley button to appear in the window. Press that button and the selected performance will have its medley designation removed. Figure 3 - Sessions window with performers on display. Use the Performers tab of the Sessions window to add or remove performers. The Session Performers tab of the window uses the 2 step edit mode. The SESSION PERFORMERS tab has 2 list boxes. On the left is the collective personnel for the session. On the right is the list for only the performers for the performance selected in the performance list above. Performers can be added or removed from one or many performances. Select one, several or all performances in the performance listbox. Pressing the Add Person to Performance button, the delete key or dragging from the Collective Session Personnel list to the Selected Performance Personnel list will process the personnel for all selected performances. Person Person is a lookup field. Only persons previously entered in the PERSONNEL window can be used in this field. Type the leading significant characters of the last name of the person and watch as the select list will display entries that match. Select one of these. Skill Enter the abbreviation for the instrument played by the person. Only instruments already entered in the INSTRUMENTS window can be entered here. As a valid abbreviation is typed, the popup to the left of this field will change to the corresponding full name for the instrument and the text will become bold as a valid instrument abbreviation is completed. Skill popup Instead of typing the instrument abbreviation in the Playing field, this popup can be used to select an instrument. When an instrument is selected via the popup, the corresponding abbreviation will appear in the Skill field. Add Person to Performance Once a performer is entered in the Person field, use the Add Person to Performance button to the right of the Person field to add that person to the performance(s) selected in the performance listbox. If a person plays multiple instruments during a performance, then enter the performer multiple times - once for each instrument. It is not possible to enter a performer twice with the same instrument. Performers can only be added to a performance. The performer is, by default, added to the session only after being added to a performance. Select the performance(s) the performer is to be removed from. Then select the performer(s) to be removed from the Selected Performance Personnel list. Use the delete key on the keyboard to remove the selected personnel. There is no "second chance" warning before the removal is done. Select the performance(s) that will receive the added performer. Then select the performer(s) from the Collective Session Personnel list that will be added to the performances. 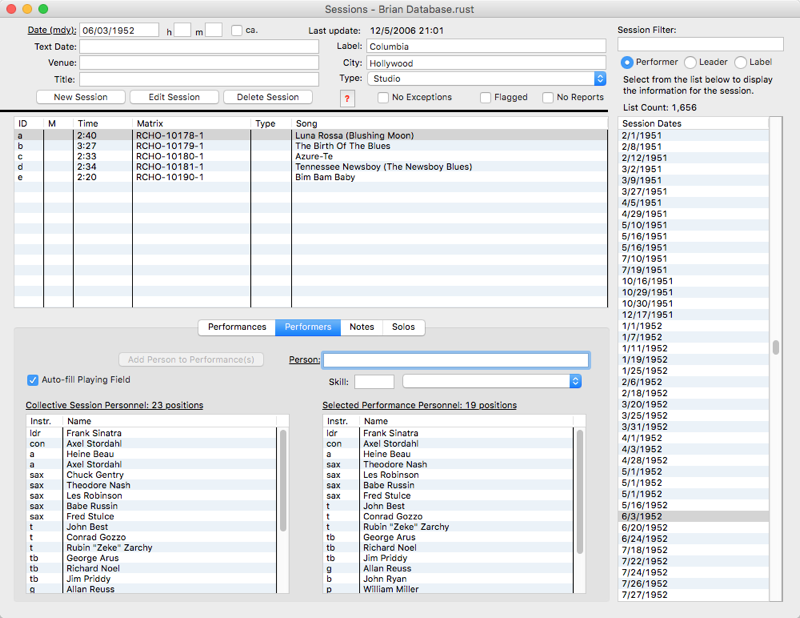 Drag the selected performers to the Selected Performance Personnel List. Select the performance(s) that will receive the added performer(s). Then generate any kind of session list from the List menu. Drag a selected session from the list to the Selected Performance Personnel List on the Sessions window. The collective personnel from the dragged session will be added to the selected performances. Figure 4 - Sessions window with notes on display. Session notes This is a free form notes field for the session that can be displayed in reports. Work notes This notes field is for private notes regarding the session. This field will not be included in any reports intended for public display. At this time, there is no report in BRIAN that includes this field, but in the future it may be included in some kind of work report. Source notes This notes field is for source notes regarding the session. This field will be included in reports intended for public display. Edit Each Notes fields has an associated Edit button. Press the Edit button to bring up a text window that will allow adding or editing the notes. When finished adding or editing the notes, press Save to save the entries to the database.